Old meets new in the same station of the London Underground. Photo by Ian Mansfield. This post is part of a series covering the 2011 Sustainable Transport Symposium in Kocaeli, Turkey from April 6-8, 2011, an event hosted by EMBARQ, the producer of this blog. In the first day of the 2011 Sustainable Transport Symposium in Kocaeli, Turkey, EMBARQ Turkey Director Sibel Bulay highlighted the need for three dimensions of sustainability: economic, social and environmental. She called for a change in cities’ priorities, from moving cars to moving people. Speakers presented examples and lessons learned from cities that have adopted a sustainable transport vision. Nick Bromley discussed Transport for London’s integrated approach to transit, economic development and land use planning, highlighting the importance of political leadership and sound planning. Bromley reinforced the concept of using a carrots-and-sticks approach to achieve sustainable transport goals: provide disincentives for using private cars, while increasing the supply of transit and biking. 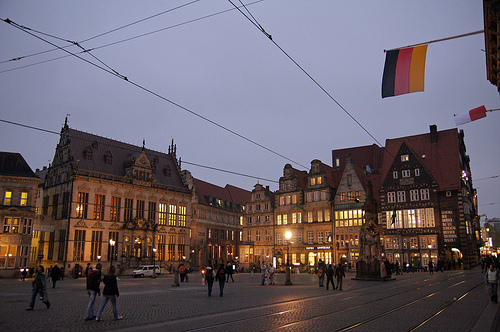 Tramways line the streets of historic downtown Bremen, Germany. Photo by Allie_Caulfield. Several speakers shared examples of sustainable transport from cities in the European Commission’s CIVITAS Initiative to support and evaluate the implementation of ambitious integrated sustainable urban transport strategies. Bruno Corbucci talked about the vehicle access restrictions Rome, Italy implemented in 2001 to reduce the number of vehicles in the city center. The automatic plate number recognition system identifies unregistered vehicles and issues them a fee for entering the city center. Rome’s local mobility agency developed an intelligent transportation system that provides online public transit and park-and-ride information, trip planning, schedules and maps. 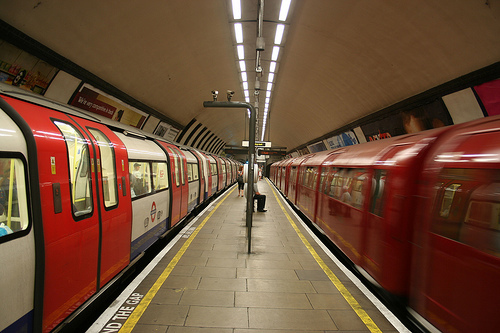 This evolved into an information technology tool for managing transport systems at large events and was demonstrated at the 2010 South Africa World Cup and Delhi Commonwealth Games and will be piloted at the London 2012 Summer Olympics. Graz, the second largest city in Austria and 2008 CIVITAS City of the Year, prioritizes “Gentle Mobility,” which Gudrun Uranitsch explained includes walking, biking and public transport. Uranitsch shared many examples of how Graz has transformed itself from a car-oriented city to a citizen-oriented city. Most notably, the speed limit was reduced to 30 kilometers per hour on 80 percent of city streets (it’s only 50 kilometers per hour on arterials.) The city declares its love of cyclists by posting colorful signs around the city that say “Thank you for cycling” and educates citizens of all ages to ride bicycles safely, with lessons on the street in real traffic. Dr. Hayri Baraçli, general manager of IETT, Istanbul’s public transport agency, pointed out that the city’s transport system consists of diverse services from local bus to heavy rail and carries 3 million passengers per day (1 billion per year.) The cumulative distance these passengers travel daily would circle the earth 12 times each day. Istanbul’s Metrobüs BRT is currently expanding the 43-kilometer system by 10 kilometers. It saves 613 tonnes of CO2 every day and moves 30,000 passengers per hour in each direction at commercial speeds of 42 kilometers per hour. Metrobüs can continue to improve by addressing some of the lessons learned from the initial corridor. But, as the session moderator, Professor Gökmen Ergün remarked, Metrobüs is a success story with an extraordinary capacity. It deserves the name Metro! Metro do Porto shares the upper deck of the Dom Luís bridge with pedestrians. Photo by Daniel Sparing. Alexandre Blaquiere discussed how Toulouse, France is focused on linking urban planning and public transport policies in order to increase public transport use. The city didn’t have enough money to extend the rail network, so instead, focused on integrating existing modes to provide passengers with more choices. Toulouse found that public transit signal prioritization reduced travel time by 10 percent to 15 percent and waiting times at traffic lights by 50 percent. They found that transport-on-demand service was an appropriate solution in lower density areas with demand of less than 2,000 passengers per day. Tom Godefrooij of the Interface for Cycle Expertise (I-CE) of the Netherlands said that cycling is an important component of sustainable transport and particularly well suited for short door-to-door trips. In many cities in the world, a significant number of trips are short enough to be made by bike: in the U.K. one third of all trips is less than 1 mile. In the U.S. half of all trips are less than 3 miles, and in Indian cities between 56 percent and 72 percent of trips are less than 5 kilometers (3.1 miles.) So there’s great potential for cities in these countries to increase their bicycling mode shares. Godefrooij also pointed out that using bicycles as feeders to public transport effectively extends the catchment area of the transit system. He recommended that cities be sure their bicycle network are coherent, direct and safe. Pedro Pereira presented Porto, Portugal’s Metro system. The 63-kilometer rail system was completed in less than 10 years under a public-private partnership agreement, with about €2.5 billion capital investment from government sources. Twelve percent of trips, or 53.4 million passengers per year, are carried on Metro, with 25 percent of users coming from cars. The architecture and urban design of the new metro stations has been a priority, and after construction began, the bus system was reorganized to ensure the bus routes were fully integrated with the Metro stations. Metro do Porto makes community engagement a priority and regularly has musicians perform in the stations. Regular surveys indicate 80 percent customer satisfaction. Kassel, Germany, the sister city of Kocaeli (the host city of this week’s conference) provided the final sustainable transportation example. Sabine Helms described Kassel’s tram, RegioTram Nordhessen, to illustrate how trams can constitute sustainable transport especially in small- and medium-sized towns. 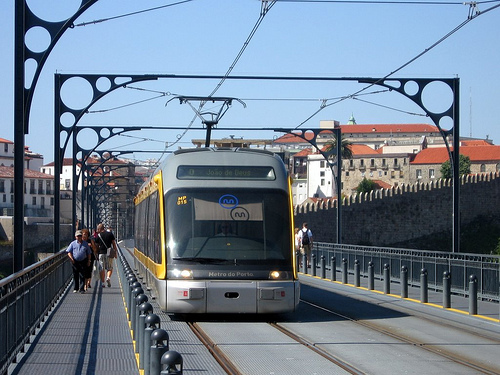 The region couldn’t afford to extend the heavy rail network, so instead, RegioTram uses existing regional rail network infrastructure plus local surface roads to enable residents to travel from surrounding areas to the city center without transfers. The trains use hybrid electric vehicles, with a diesel engine for parts of the corridor without overhead electric wires. The €180 million project increased public transport ridership from less than 2 million passengers per year to 5 million passengers per year.